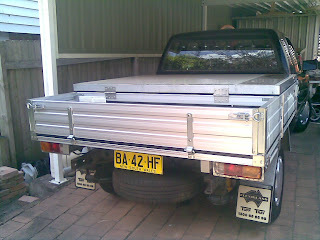 Malcolm Faed's Blog: My ute is now road legal. After about 4 months of planing and another 11 of construction. The Hilux is now fully road legal! What a marathon, and a relief. I got the blue slip, green slip and plates this morning. Now it is time to enjoy the fruits of my labour. The first thing to do is take the family to lunch to celebrate!